#EarthDay2017 Are We Prepared for Overpopulation? 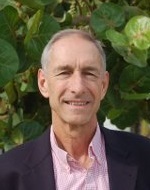 Timothy H. Dixon author of Curbing Catastrophe is a Professor of Geosciences at the University of South Florida. In his new article he considers the future threat of over-population, the predictions that could have been and presents ideas for an optimistic move forward. Next year (2018) marks the 50th anniversary of the publication of The Population Bomb, by Stanford biologist Paul Ehrlich. Ehrlich predicted that rapid population growth would lead to shortages in numerous raw materials, and would soon outstrip the world’s food supply, leading to mass starvation. He stated “In the 1970’s, hundreds of millions of people will starve to death…nothing can prevent a substantial increase in the world death rate…”. Subsequent editions of the book modified the prediction to the 1980’s. Obviously nothing of the sort happened, a great example of the challenges inherent in making predictions about the future, especially if it involves something as complicated as the Earth, its environment, and human behavior. Ehrlich’s opinions on population growth were influenced by the earlier work of Thomas Malthus, an English cleric and scholar who lived between 1766 and 1834. Malthus believed that population growth was mainly limited by food supply, and that while populations could increase quickly, food supply could grow only slowly, so that food scarcity was always an imminent possibility. He argued that social policies that limited population growth, such as family planning or later marriages, were necessary to avoid what became known as the “Malthusian catastrophe” of famine. Why was Ehrlich so concerned about over-population? It may reflect his background as a professional scientist in the discipline of biology and his knowledge of population dynamics. Biologists sometimes use predator-prey models to examine certain aspects of population. Mathematical equations are available to describe the populations of two co-dependent species, such as the number of rabbits or hares (prey) and lynxes (predators) in a given ecosystem (Figure 1). Figure 1. 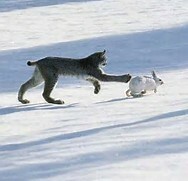 A lynx (predator) chases a hare (prey) in a boreal forest ecosystem in winter. Solutions to the predator-prey equations usually have the form of two oscillating curves, with the population of predators slightly lagging the prey. 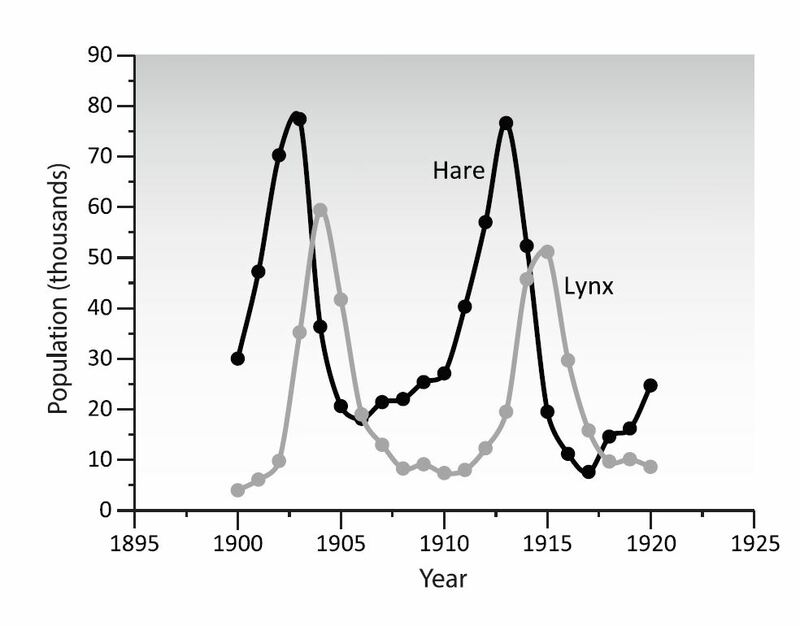 A classic example is based on a long time series of data on lynx and snowshoe hare populations in North America, collected by the Hudson Bay Company in the 1800’s and early 1900’s (Figure 2). The company provided a market and clearing house for furs collected by trappers. Figure 2. Number of hare and lynx pelts purchased by the Hudson Bay Company in Canada in the early part of the 20th Century. From Dixon (2017). The data set is actually the number of pelts purchased by the company, but this is a reasonable proxy for the overall population of the two species. 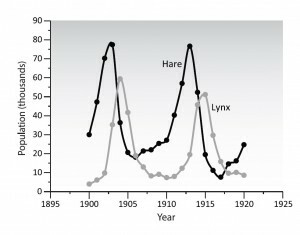 The two curves show a decadal cycle for each population, with peaks in the lynx population lagging peaks in the hare population by one to two years. It is usually explained as follows. Initially, the population of both hares (prey) and lynxes (predators) is low. Since predation levels are low, the hare population grows rapidly. Eventually, the lynxes start to benefit from the increased food supply, and their numbers also grow. But with increased predation, the number of hares falls. Within a year or two, this loss of food supply starts to affect the lynxes, their population also falls, and the cycle starts again. Note that the “peaks” and “valleys” in the number of predators lag those of the prey by a year or two, and the number of predators is always less than the number of prey (it takes a lot of hares to feed a hungry lynx family). As with any model, there are certain simplifying assumptions. For example, the model assumes that the prey has no other predators, and the predators have no other food source. Also, the prey must be sufficiently diverse or clever such that they cannot be wiped out by the predators, otherwise both populations would soon go to zero. In reality, population dynamics are more complex. While lynxes mainly depend on hares for food, hares have other predators. The hare population is also affected by disease (which can also cause cyclical effects) and food availability, which responds to climate trends. Nevertheless, the model is successful at explaining some of the first order controls on the hare and lynx populations, and the populations of many other predator-prey pairs. The equations describing the predator-prey relations have been applied to many biological species, and also to things as diverse as rain clouds (which “feed” off a local supply of moist air) and the price of oil and other commodities (which experience boom and bust cycles, just like hares). Now let’s consider what happens if the predator population goes to zero, and see how this might apply to humanity. Common sense suggests that if the predators go away, the prey will increase. In fact, the mathematical equations show that the prey grows exponentially (i.e., rapidly) with time. Of course at some point this becomes unrealistic – eventually the prey runs out of food. In a finite system (including the Earth) exponential growth always hits some limit that is not described in the simple predator-prey model. Does something similar apply to humans? Humans are no longer threatened by large predators (we’ve killed most of them, or put them in zoos). Until the 19th Century the main limits to human population growth were disease (which functions something like a predator) and food supply. Advances in medicine have greatly reduced the toll from disease, while technological developments in areas such as fertilizers, pesticides, agricultural techniques, and food preservation and distribution have greatly expanded food production. These improvements in medicine and food supply have led to rapid growth in human population. When The Population Bomb was written, human growth rates closely fit an exponential curve, which Ehrlich considered a recipe for disaster. In mathematics, exponential trends have many interesting features, one of which is that the quantity being studied quickly goes to infinity (not a good environmental outcome). 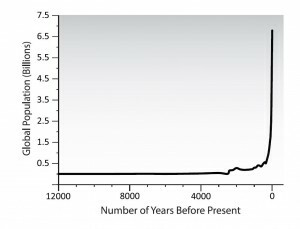 Ehrlich was merely pointing out that the curve describing human population growth put us on a trajectory that was impossible to sustain (Figure 3). Figure 3. 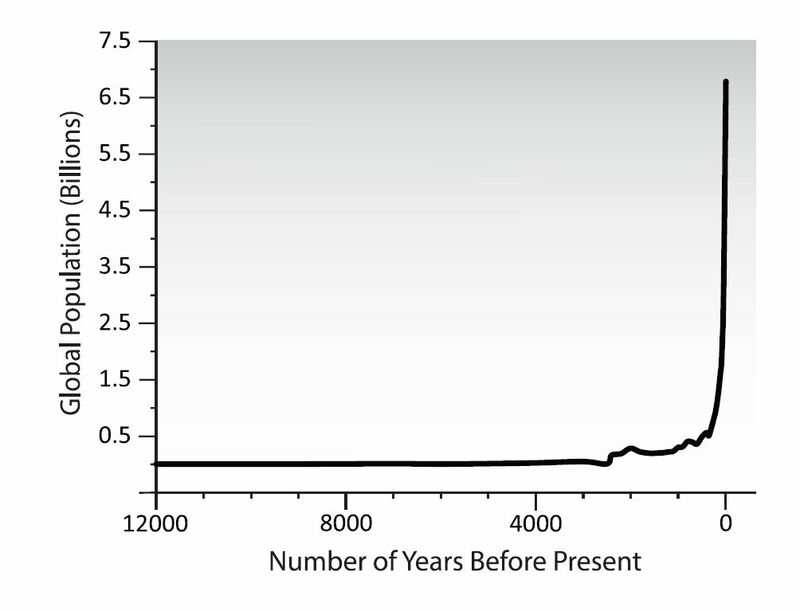 Human population over the last 12,000 years. The brief “dip” in population growth around 400-800 AD (1200 – 1600 years before present) and uneven growth in the next few centuries may represent the influence of the Justinian and later plagues, when Black Death (possibly bubonic plague) first began to devastate Europe and Asia. 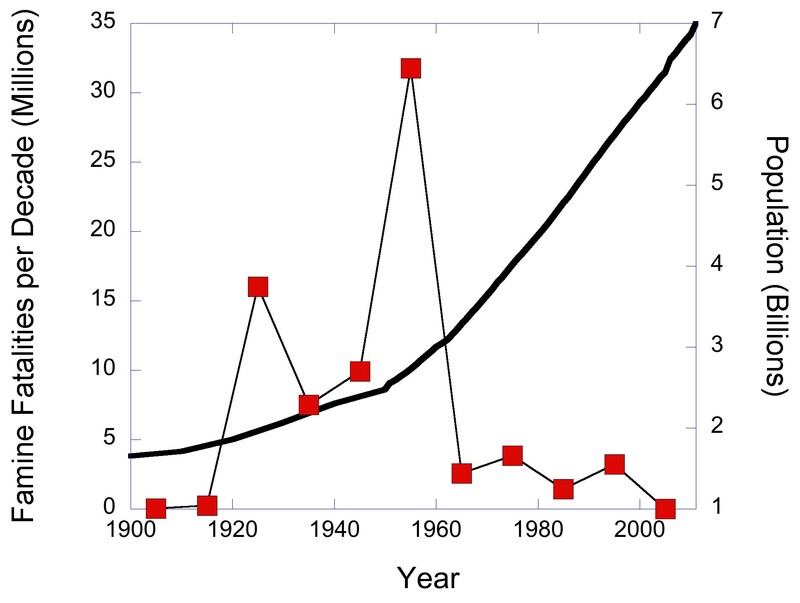 The arrow marks the approximate time between the development of the Haber-Bosch process (1910) which enabled large scale production of nitrate fertilizer, and the discovery of penicillin (1928) by Alexander Fleming; note the rapid increase in population after that time. Data sources: United Nations; US Census Bureau. From Dixon (2017a). Economists had long debated Malthus’ concepts, but they ridiculed Ehrlich’s predictions, pointing out that he failed to account for technological innovation. His mass starvation prediction failed to materialize in large part because of the “green revolution” whereby improved strains of key crops enabled greater yield, keeping up with food demand. Economists also faulted Ehrlich for not recognizing the impact of supply and demand theory on commodities, which generally guarantees that shortages are not permanent: temporary shortages lead to price rises, which incentivizes increased supply, and also tends to dampen demand, until the two are again in balance. Ironically, the mathematics of supply and demand can function something like predator-prey models. A plot of world population versus the number of famines illustrates the point (Figure 4). Both increased until the late 1950s, after which the number of famines plummeted, even though population continued to increase. It is now recognized that famine is mostly caused by civil war (restricting food distribution) or government policies (restricting food production or trade), rather than fundamental shortages. At the present time (2017) five countries are experiencing severe food shortages in at least parts of their respective territories. Four are related to civil war (Syria, Yemen, Somalia, Nigeria) while one (Venezuela) reflects government policies. Figure 4. 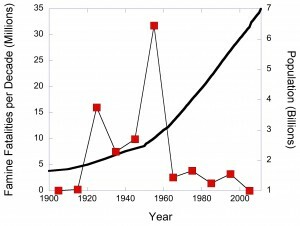 Global population compared to the fatalities per decade caused by famine (red squares). Famine data are plotted at mid-decade. Population data from United Nations, famine data from Devereux (2000) and the Emergency Events Data Base (EM-DAT). In 1980 Ehrlich made a famous bet with economist Julian Simon concerning the price of several commodities in 1990 (Ehrlich bet that they would be higher, reflecting shortages, while Simon bet that they would be cheaper). Ehrlich lost the bet. Commodity prices go through dramatic price swings on the decadal time scale, often called boom and bust cycles, that are not related to long term supply. They are not directly related to population, and can look a bit like classic predator-prey models. Simon’s success, and the apparent failure or Ehrlich’s thesis, was a key turning point in the environmental movement, marking the beginning of a conservative backlash. Aspects of that backlash can be seen today in the politics of many western countries. In the US, the election of Donald Trump as president, who has called climate change a hoax, and his appointment of Scott Pruitt to head the US Environmental Protection Agency, are recent manifestations of the backlash. Pruitt has promised to role back rules that limit pollution from coal-fired power plants. Despite the failure of most of Ehrlich’s predictions, there is an underlying truth to his basic premise: increasing global population, and increasing consumption, are contributing to a number of environmental problems. When Ehrlich made his predictions in 1968, world population was about three and a half billion. By 2011 it hit 7 billion, and is on track to exceed 9 billion by 2050. Regardless of whether you think this is good or bad, the impact on the planet’s ecosystems is undeniable. A study published by the London Zoological Society suggests that the number of species on Earth has fallen by roughly one half in the last four decades. Other studies put the estimate over this period at a somewhat lower value, around 25%. Even the lower number is frightening to scientists who study ecosystems, because of the well-known need for diversity (see Dixon, 2017b). The losses are mainly due to shrinking habitat (our cities and farms take up lots of space). Climate change also plays a role, one that will likely increase in the future. Fish stocks in the ocean have also plummeted, due to over-fishing, pollution, and acidification. Atmospheric CO2 now exceeds 400 ppm, the highest level the planet has seen in millions of years. Ehrlich was clearly wrong in the timing of his predictions, but some of what he forecast is now coming to pass. Habitat loss and climate change are two of our biggest environmental problems. Both are direct consequences of our increasing population. So what should we do about all this? Ehrlich discussed several possibilities, but recognized the difficulty. Attempts by governments to influence family size, whether to larger or smaller values, have mostly not worked. In this most personal of choices, outside influences, especially in the form of official government policies, are resented and rarely successful. Demographers point out that as societies get more wealthy, family size tends to go down, stabilizing at something near the replacement rate (~ two children per family). Since more and more of the world’s population are achieving some sort of prosperity, it’s possible to imagine world population stabilizing in the near future. Since we can’t do much about global population, perhaps it would be more useful to think about the kind of society and environment we would like to see for our children and grand-children once global population has stabilized, and then focus on the actions needed to get there. On my short list of things that would make the future a better place for our children and grandchildren, and are also politically feasible, number one is to make our cities more livable. My favorite solution (below) has the beneficial side effect of reducing two of our planet’s biggest environmental problems. Lets make cities more livable. Everyone has different ideas about what makes a great city. But all of the urban activities that people engage in would benefit if cities had cleaner air. The World Health Organization and several independent groups estimate that approximately 3 million people per year world-wide die prematurely from air pollution, mainly from heart disease, stroke, and lung cancer (premature death is defined as the loss of a decade or more of life span). Most of these deaths occur to people who live in cities, and most are caused by pollution from gasoline and diesel-powered cars and trucks, and from coal-fired power plants. In the US, approximately 200,000 premature deaths every year are related to air pollution. Even higher numbers probably apply to the EU, because of the higher proportion of diesel cars and trucks (diesel exhaust puts out a higher proportion of fine particles, which can penetrate deeply into lung tissue). While coal gets most of the bad press, it’s really the cars and truck that are killing us, because their emissions are closest to where we live and work – in cities. Imagine being able to enjoy an outside table at your favorite café, or walk or bicycle to work, without having to listen to deafening traffic noise or choke on fumes from passing vehicles. What kinds of changes are needed to make this utopian vision a reality? It turns out that critical changes are already underway. We probably won’t even have to wait 50 years. And there are some simple things that cities and individuals can do to speed up the process. Coal-fired power plants are slowly going the way of the dinosaur, partly because of cost, and partly because of the bad press they receive based on their air pollution. Even if the current US government tries to back-off regulation, litigation by NGOs and other private groups is likely to raise the cost of continued operation of the older, dirtier power plants. Many companies are already seeing the handwriting on the wall and shuttering the worst plants. In India and China, which still have large numbers of coal-fired power plants, there is official recognition of the air pollution problem and serious attempts to fix it. Natural gas (a much cleaner fuel) and wind and solar powered plants are growing by leaps and bounds in all three countries. In the meantime, electric vehicles (EVs) and hybrids are finally starting to become realistic alternatives to fossil-fuel powered vehicles. Both trends promise cleaner city air within a few decades. The other innovation that is making rapid progress is self-driving cars. Consider a future company that plans to operate a fleet of self-driving cars. The economics of the business will virtually demand that the company use EV technology, because of greatly reduced maintenance (EVs have more than an order of magnitude fewer moving parts compared to fossil fuel vehicles) and greater certainty on fuel costs (the cost of fossil fuels is likely to increase, either because of scarcity, environmental regulation, or both). Self-driving EVs are also quieter – no need to blow horns if all the well-behaved computer-controlled cars behave themselves, which also helps to make the city more livable. Self-driving cars also reduce the need for parking, which eats up huge amounts of space in our cities. Imagine if half the area currently used to park cars in our cities was used instead for green space. In addition to providing opportunities for recreation and relaxation, that additional green space would also provide much -needed habitat for birds and other wildlife. Ironically, while the environmental problems that these innovations help to reduce were ultimately caused by the size and rapid growth of human population, it is also true that technological innovation that leads to things like EVs and fleets of self-driving cars is facilitated by a large population – more people to think up the innovations, and larger markets that venture capitalists, who fund the development of those innovations, can exploit for profit. Can cities nudge this worthy process along? Right now a number of unintended subsidies promote the use of individually-owned fossil fuel cars. Examples include free roads and subsidized parking. Operators also don’t have to pay for the health problems caused by their vehicle’s emissions. Reducing these unintended subsidies (e.g., by charging high parking fees for fossil fuel vehicles), and incentivizing EVs (e.g., with free parking and free charging stations) would go a long way to cleaning up our cities. A politician who promised to reduce the number of needless deaths caused by polluted air from fossil fuel vehicles by enacting these changes would get my vote. The fact that these changes also mean more wildlife habitat and lower CO2 emissions is a nice side-benefit for the planet. * The quotation at the beginning of this article, or something close to it, has been variously attributed to a Danish proverb, physicist Niels Bohr, movie producer Sam Goldwyn, various humorists and poets, and even baseball player Yogi Berra. Caiazzo, F., A. Ashok, I. A. Waitz, S. H. L. Yim, S. R. H. Barrett (2013) Air pollution and early deaths in the United States. Part I: Quantifying the impact of major sectors in 2005, Atmospheric Environment 79, 198-208. Devereux, S. (2000) Famine in the Twentieth Century, Institute for Development Studies, Working Paper 105, 40 p.
Dixon, T. H. (2017a) Curbing Catastrophe. Cambridge University Press, 300 p. (plus on-line Appendix). Emergency Events Database (EM-DAT) (www.emdat.be), published by the World Health Organization, Centre for Research on the Epidemiology of Disasters (CRED). Ehrlich, P. R. (1968) The Population Bomb. Ballantine Books, 201 p.
Sabin, P. (2013) The Bet: Paul Ehrlich, Julian Simon, and Our Gamble over Earth’s Future. Yale University Press, 304p.